Posted on 08/03/2010 at 11:59 AM. 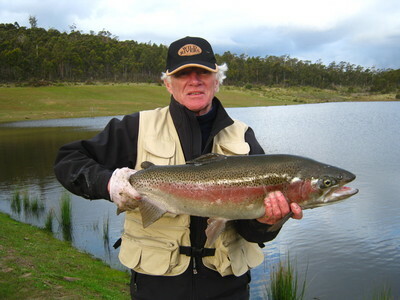 , a vacancy has come up on the March 21-24 trip to Twin Lakes Tasmania. Twin Lakes is a private fishery with 2 dams, one large – 45 feet deep and one smaller with a maximum dept of 25 feet, and festooned with trees & logs. Trophy Rainbows and Browns are the order of the day, with the best rainbow so far 24 lbs (I didn’t catch it.) and the best brown 14.5 lbs (I did catch it.). Atlantic Salmon are in both dams, with my best fish so far going 13 lbs. 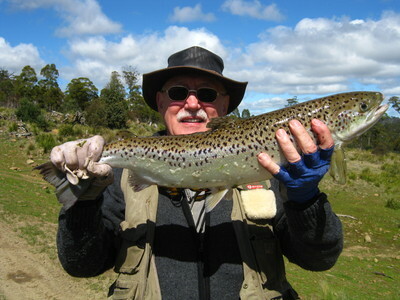 It’s strictly fly fishing, catch and release, so the big fish caught last year are still there and bigger. March 21 – 24; pick up at the airport at 10:30 AM March 21; drop off at the airport at 6:00 PM March 24. The accommodation is a 3 BR lakeside cottage with a full kitchen, dining and living area and an outside hot tub. The cost is $1,100, plus transport ($100 shared); meals are cook your own or have Twin Lakes prepare breakfast and lunch for $15.00 each pp and dinner $40.00 pp. 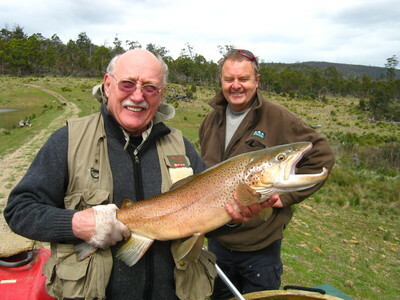 If any sociable and keen trout fishermen are available please contact Jim Moreley while the opening is still available. Thanks, Justin, it’s a pity you are busy. Jim Moreley 0412 220 775. Posted on 08/03/2010 at 12:00 PM. Posted on 08/03/2010 at 12:01 PM.